Th e main characteristic of KuanguKuangu is the diversity of the different desert landscapes in the region. The great expanses of sand and the rocky plains alternate with endless areas of savannah grass, majestic mountain ranges, and patches of vegetation which surround the stretches of bright red sand. The variety of the flora and the fauna is as fascinating as the nuances in the colures of the landscape, which change continually over the course of each day. These surroundings are unique, undergoing constant transformation, and cannot be captured by photographers, nor depicted in books. One can only experience it, on the spot, here at KuanguKuangu. Situated in the peaceful solitude of an idyllic valley, in the heart of the desert, KuanguKuangu is the ideal place for travelers who seek tranquility and intimacy. Nestled in a dune, KuanguKuangu makes it possible for its occupants to live in harmony with nature, at the same time offering them comfort, luxury, adventure and relaxation. The natural materials used for the constructio n of KuanguKuangu blend perfectly with the surrounding landscape. Combinations of vibrant earth tones and raw materials such as canvas, wood, stones, logs and sand in an essential wilderness mix to keep a sense of the old safaris, transcending the ephemeral nature of modern decor fashions to harmonize with the natural world. 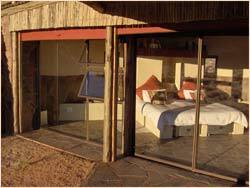 KuanguKuangu has one main room, which opens out towards the valley, and is centered around a bed. You will be able to enjoy at leisure both sun up and sun down on the Barchan dunes. Simple and uncluttered, the bedroom with a spectacular view is an oasis of quietness and inspiration. Behind this main room are the bathroom and the kitchen, built around a rock in perfect harmony with the natural environment. This open-air part of KuanguKuangu offers a panoramic view of the mountains situated behind KuanguKuangu during daytime… or of the starry heaven as soon as night has fallen (the Namib desert is reputedly the best place in Southern Africa to observe the stars). The starry sky in southerly direction will thus be visible to the naked eye, unobstructed, from the rock around which KuanguKuangu is built. KuanguKuangu comes from "Omukuangukuangu", a word used by the Ovambo people, meaning the milky way. 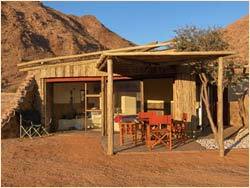 On the practical side: drinkable running water, hot water available thanks to the « donkey » system used by Namibian farmers (water is heated by wood fire), stove as well as all the necessary cooking equipment in the kitchen, and a « braai » (barbecue) outside. Electricity (220V) is generated by solar panels. Also KuanguKuangu is covered by the Namibian mobile telephone network. It is neither a lodge, nor a hotel. KuanguKuangu is a unique structure, and was designed for a maximum of two people (if you are more, you might be able to find accommodation for the others of your group at the farm Barchan Dune Retreat, situated at five minutes walking distance from KuanguKuangu).